The 30 most popular first dates in the UK have been revealed. 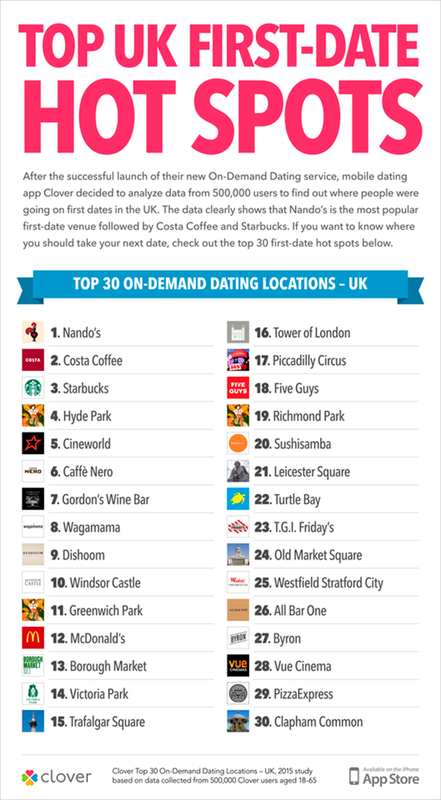 Dating app Clover collected data on over 200,000 daters and found the UK's favourite places to go on a first date. The results are frankly quite embarrassing. The UK's favourite spot for a first date is apparently a cheeky Nandos. Not the classiest of places to have a first date, unless you're really into chicken. 10) Windsor Castle - Why do people want to have the queen watch them attempt to awkwardly kiss a stranger? 15) Trafalgar square - "A restaurant sounds nice, but wouldn't you prefer to go somewhere where a pigeon can sh*t on us?" 16) The Tower of London - Want to let your date know you're into weird 50 Shades of Grey style torture stuff right from date one? Take them to the Tower of London and impress them with your disgusting knowledge. Before you get too depressed at the state of British romance, remember the data is likely skewed as people who take first dates to Nandos may never get beyond that first date, and are doomed to go on endless first dates with new partners at their favourite chicken joint, forever skewing the data, before dying alone. Also, we choose classier places to date than the US do. How do we compare to the US? America seem to use first dates to parody themselves. Their top first date spot is Starbucks, exactly what you'd expect from them considering every second thing in America is a Starbucks. 9) In-N-Out Burger - "Ok I'll date you, but in literally the fastest manner possible. We get in, we get out, no hanging around and waiting for food or any goddamn talking, for Christ's sake." 23) Yoghurtland - Nothing says romance like an excess of yoghurt. 25) Torchy Tacos - Sounds classy. For first dates that might actually make them want to try a second date, take a look at our restaurant deals. Nothing is sexier than a man with coupons.